A Book a Day for Thirty Days. … and frogs and toads and snakes. O, my! 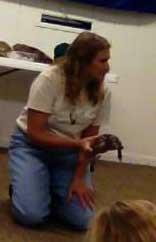 Showing the Gulf Branch Nature Center reptiles to the birthday party attendees has been an absolute blast for me. As a former teacher, I really appreciate being able to enjoy the instructional part without the daily toil. Each party is different, as are the parents and the children. The children vary in ages from 3-6 and sometimes their older siblings come along as well. Before the children and parents arrive, I decorate the room with posters and pictures available at the center and put up the “Private—Birthday Party” sign. I gather the materials that I intend to use for the talks on a table in the front of the room and place a cloth over them to keep the children from playing with them. The center provides puppets, skeletons, models, and other audiovisual aids to help the kids learn about the life cycle of the different reptiles and amphibians. The one they seem to like the most is the frog croak identifier. Pushing a button elicits the different calls of the specific frog. I let the kids take turns pushing the buttons. At a frog and toad talk, which was a Princess and the Frog theme with all little girls, I had the girls make “frog eggs’ with water and dish soap. They blew bubbles through a straw to make the eggs. Some parents bring activities to start the party, such as assembling binoculars made from toilet paper tubes or string toss toys. At one party, the parents even brought in a face painter. The parents bring their own party decorations, delectable snacks, and cake. As the kids arrive, I ask them to make up name tags for themselves so I can call out their names during the talk. The hardest thing is getting them to understand a skeleton. The children always ask if it’s alive. I have to tell them it died, then explain soft tissue and hard tissue. It’s a little sad. I try to point out the similarities to humans that the animals have. I emphasize their abilities and adaptation to their their habitat. Bringing out the live animals for the kids to touch is the pièce de résistance. Their eyes light up, their necks stretch up, and they sit forward. Some are a bit squeamish, especially around the snake. The snake inspires giggles and snickers when he tries to crawl to the warmest spot on my body. I’ll give you a moment to think where that is. For the frog and toad talks, I can only bring out the toad. The frog leaps into walls, tables, chairs, people. It can elicit squeals of delight and fear, but it’s not good for the frog. Since the animals are adapted to humans, they are very active. The turtles never go into their shells, so I have to use the puppet to demonstrate that ability. Sometimes the parents get involved, as well, which is great. I have also taken to bringing my iPad to show YouTube videos that show the animals in the wild. Of course, after the talks there’s the cleanup. Some parents invite me to join the party, which I should probably pass up. But who can resist cake? I have a great time and the parents and center staff are very helpful and appreciative. So if you’re considering a birthday party for your children, check your local nature center for availability. You would be amazed what they have there. These talks are part of my certification program for the Arlington Regional Master Naturalists. The program requires 40 volunteer hours and 8 continuing education hours to receive certification, but I would still do it without the requirement. I’m a 57-year-old retired lady with a pretty sedentary lifestyle. Three years ago I was diagnosed with osteoporosis. It was quite a shock. I thought that happened only after you hit 65 or so. My doctor suggested Pilates, but exercising with no real end goal in mind did not appeal to me. Since my husband has cancer and his treatment regimen leaves him in a weakened state, partner dancing was not an option. I decided to try belly dancing. Seeing a friend roll a quarter up and down her stomach performing a belly dance some years back during my college years, the dance form seemed a great option to strengthen my core muscles while having fun. In my former life I was pretty active. I used to hike, rock climb, scuba dive, and bike. The highs I experienced through my successes with these efforts left me always wanting more but not knowing where or how to get it. With my aging body and declining physical prowess, I felt that such highs lay beyond the scope of possibility for me. In spite of that, I attended the “assessment” at Saffron Dance Studio where I was selected for the Oriental Apprentice Group, a group for not-ready-for-prime-time dancers. The studio director informed us that if we were not sufficiently prepared for the performance, even up to the day of the event, she would yank us out of the lineup. In addition to my physical limitations, I also have Attention Deficit Disorder (ADD). I’ve had it all my life and it has been the bane of my existence. The disability has achieved recognition in the modern classroom and children receive special assistance to compensate. Schools didn’t have that in my day. You were left to flail about on your own. I took diving lessons in high school. Once I leaped on the board to execute my dive. In mid-jump, I blanked out. When my feet descended to the board, I froze then emitted a high-pitch “Whoops” and flopped into the water. My 9th grade gym teacher heard about the incident and told me that she heard I was a clown. For the rest of the school year, she harassed me to insure that I would not be a clown in her class. With ADD, people try to tell you that you just need to be better organized or concentrate more. Without a lot of training, it’s like telling an anteater to chew. It just doesn’t have the equipment. Our group dance instructor noticed this. When she would give me instructions, she would repeat them or make sure to speak to me directly to make sure I understood or was paying attention. Because of my disability, I also took private lessons to improve my dancing. Up until the afternoon of the performance, my self-confidence remained at low tide. My insides quaked like a bunny rabbit. I breathed like a freight train, drying out my mouth and causing my ears to pound. When our group rehearsed in the morning on the theater stage for the first time; other dance troupes, sitting in the auditorium, ululated, shrieked, and clapped. Totally unprepared for this visceral reaction, my brain short circuited and I missed my cues. My director reprimanded me later. We repeated the routine a few more times and I asked one of my teammates to review the ending with me individually. She did so graciously in the face of my request to repeat it at least ten times. For our piece, we wore purple circle skirts, jewel-sleeved midriff length stretch tops, and a body suit, accessorized with a beaded gold belt and rhinestone jewelry. Our director taught us how to apply makeup, which was a whole new experience for me. Stage lights require a whole different level of investment in makeup and learning how to apply it. It started with face primer Wall primer I know. Face primer, not so much. For theater, you need to have face, eye, and lip primer to prevent fading, topped off with setting powder. I never heard of setting powder either. My husband was staggered by the transformation: from wife to Elvira. Our director added glitter to our hair and outfits before we went on stage. The dance piece that our director selected for us was “The Seventh Veil.” When we were told we would be performing with veils, many of the group members were a little alarmed. I drew my inspiration from the biblical story of Salome and the dance of the seven veils, where she seduced Herod to get John the Baptist’s head on a silver platter. Not the most charming endgame, but that wasn’t what Salome was thinking when she danced. She was going to get what she wanted. To complement our purple costumes, our director chose gold veils, the colors of royalty and wealth. Our routine was short, a little under three minutes, but the rich swirl of colors created a moving tapestry across the stage. I never totally believed that I would get through the performance. I no longer feel like a quaking rabbit. I am now a leaping tiger. I can’t look at the pictures of the victims of the Sandy Hook Elementary School massacre in Newton, Connecticut without my eyes brimming with tears. Now from every corner someone blows in with solutions, theories on why it happened, what could have been done to prevent it, who’s at fault: ‘We need better gun regulation’; ‘God and the Bible should return to the classroom’; ‘teachers should carry guns’;’improve the mental health system.’ Reading the few articles that I can bear, I have determined that, among them, only better gun regulation may have prevented this slaughter. As we saw occur on the same day in China, where a madman attacked students and teachers with a knife, everyone lived. I agree completely that assault rifles should be removed from store shelves and not available for general use. Writers of our second amendment could not foresee the decline in gun use throughout the nation, leaving unarmed individuals vulnerable. When the amendment was formulated, the founders perceived that a defenseless population would be doomed to capture by an occupying force. Everyone who owned a gun taught their children how to use and respect them. Banning assault rifles may not have prevented the tragedy, but it certainly would have reduced the casualties. Perhaps we do need God and the Bible, but I don’t see that as a winnable dispute. What we do need and a battle that could be won is to promote better cooperation between teachers and parents. When I was teaching and called the parents to talk about their children, I was told time and again that it was my fault. The teaching colleges, school administrators, and fellow faculty members encourage this view. If parents do not demand respect at home, the teacher is faced with an ongoing contest for the children’s attention and deference. I saw the difference between the two. It was huge and directly impacted the children’s behavior in the classroom. This proposition is absolutely ludicrous. Guns are not permitted on school campuses anyway and keeping them out of the hands of students would mean that teachers would have difficulty getting access in an emergency, besides anyone who has ever been a teacher can tell you that students would crack that security in no time at all. I worked at the Veterans Administration psychiatric hospital when I witnessed the ‘lunatics’ being released from the ‘asylum.’ Many of these former patients became the mentally ill homeless who accosted people on the streets. From what I read about the mother, she wasn’t open to outside interference in her home life and she alone would have been responsible for having him committed. It appears that the boy was never in a school long enough to be referred for treatment. If he had been, I’m sure the mother would have prevented it. Another problem with that argument is: how do we remove the stigma of psychiatric treatment? I sought and received treatment for depression. If I told anyone about it, they looked at me with fear, as though I would become one of those maniacs who would gun people down in a fit of anger. It became a part of my permanent personnel record, because not revealing it could have resulted in my being fired. I believe it played a role in my being able to receive a promotion at the institution where I worked. The general population needs to recognize the wisdom of seeking treatment. I think we should start with regulating automatic rifles and handguns, then begin the longer and much more difficult task of demanding respect from our children. Educating people about mental illness should also be a priority. If you want to travel on your own, you may regret snoozing through your Astronomy and Geography classes. The ability to identify landmarks and sun and star positioning are indispensable tools that permit the traveler to navigate anywhere in the world. 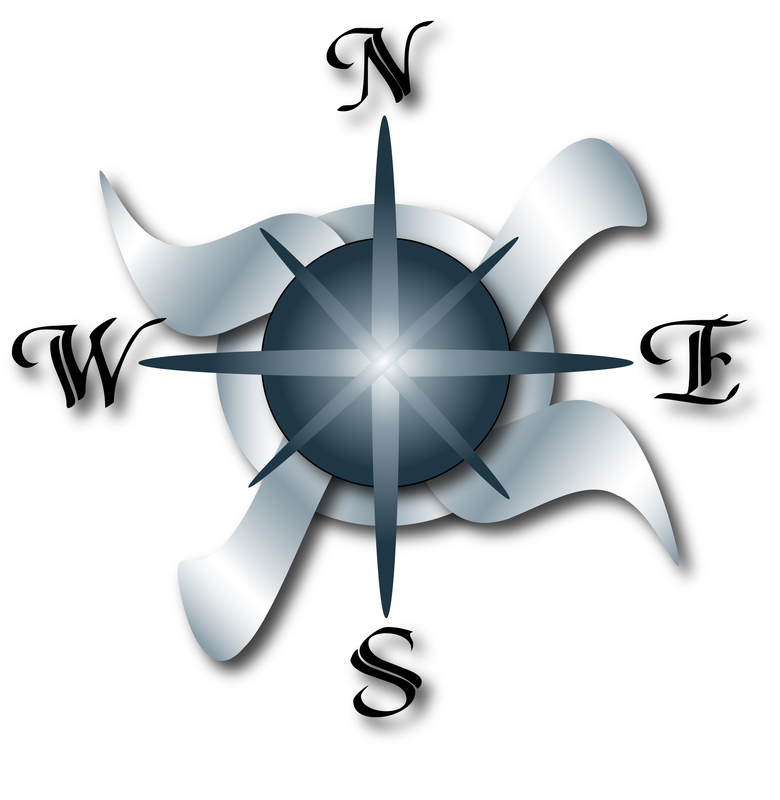 A simple, working compass is also handy. You may have heard the stories about deadly reliance on GPS, such as The GPS: A Fatally Misleading Travel Companion.You could also take along my husband, a retired Navy captain, with extreme competency in navigation, but I don’t plan to lend him out any time soon. I’ve been fortunate to have him as my companion on our many excursions, not just to other lands, but around the neighborhood as well. He pointed out a building on a main road as the turning point to our street, so I can easily find my way home. When we travel, he is my navigator. Sometimes it takes a little longer to arrive at our destination, but we still get there. He is always keenly aware of where the sun or stars are located in reference to wherever we may be. Without those heavenly bodies, he looks for other landmarks: coastlines, rivers, railroads, mountain ranges, and so on to keep us on the right path, while other people still wander around without a clue. A few pointers: Stay alert. Be aware of your surroundings. Look up. See that church steeple over there; the green roof? Make that your marker. In the morning, the sun rises in the east, so orient yourself from there. In the afternoon, the sun is in the west. If you want to go east, go away from the sun. At high noon, you may just have to wait awhile. The sun sticks right to the middle. At night, you need to find the North Star for your northern point. It’s the brightest star in the night sky. If you’re interested in learning more of my husband’s techniques, I recommend the article “Navigate without GPS” from Off-Road Magazine, which provides a great introduction for becoming self-reliant while traveling. Good luck in your travels and Bon Voyage.